Break free from boring food containers with hinged breakaway containerslids tear away easily for a quality dining experience and reseal easily for leftovers. Clear, anti-fog lids make them an excellent choice for displaying food as well as storing it. Containers are designed with easy-handling in mind, with dual easy-open tabs and secure, quick-close locking lids. Versatile containers are microwaveable. Convenient stackable design helps conserve storage space. 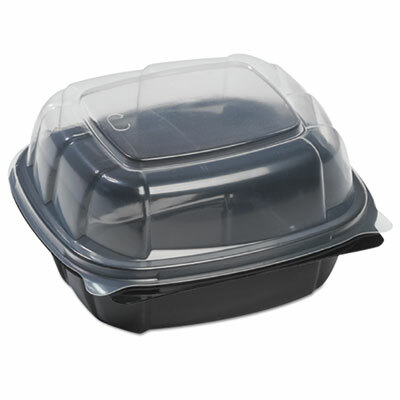 Food Container Type: Container/Lid Combo; Material(s): Polypropylene; Capacity (Volume): 21.9 oz; Color(s): Black/Clear.